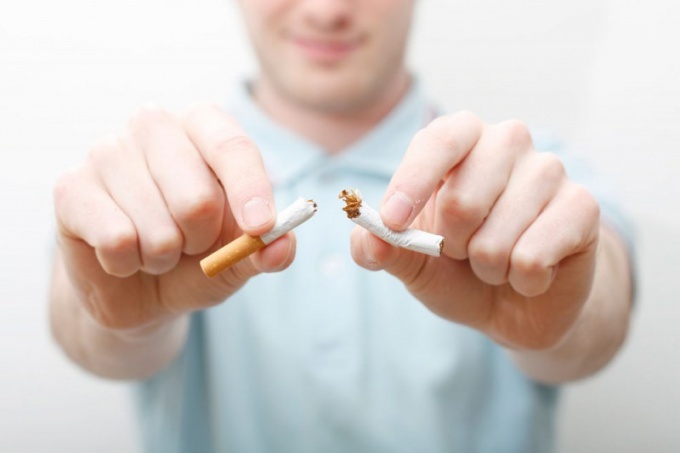 Quitting Smoking provokes in the body a major change. Depending on experience, the process of getting rid of the habits of each person can be different. However, all smokers go through several stages of cleansing the body and adjust to life without nicotine. A day after quitting Smoking the person begins to change the composition of the blood. The carbon monoxide and nicotine begins to decline sharply, and the amount of oxygen to grow. Thus, oxygen in large volumes to flow to the organs and tissues of man. These changes occur against a small weakness, reduce appetite. Smokers with great experience can begin dizziness, and sleep disturbance. Within a week the concentration of nicotine in the blood is still falling, that subsequently causes symptom nicotine cravings. On the background of detoxification can occur respiratory disorders, cough. In some patients there is increased nervous irritability, sweating and even trembling hands. There may be sleep disturbances and dizziness, which cause the majority of smokers desire to return to the pernicious habit. In the first week after quitting Smoking starts the restoration of the mucous membranes of the mouth, lungs and intestines. Active is sputum, which can often be painted in a dark color. Starts to normalize the activity of the stomach, pancreas, intestines and gallbladder. Improves heart vitality, improving blood flow to the brain. During the month, continuing the healing of the lungs, stomach and intestines. You may experience symptoms such as abdominal pain, constipation, bitter taste in the mouth, belching and heartburn. However, after the restoration of normal functioning of organs without nicotine these symptoms are causing improvement and recovery of the tissue. A month completely normalizes the activity of capillary and vascular walls, improves the immunity against the recovery processes of blood formation. Partially recovered the sense of smell and taste in the process of eating. At this stage the smell of tobacco can cause some disgust. The cough becomes less and less. Increases appetite, against which possible significant weight gain. However, even after a month may experience sleep disturbances, pressure surges, and frequent headaches. Still the psychological dependence on nicotine, which manifests itself in the frequent desire to smoke. Six months later, the renewal of skin cells is completed. Normalizes the tone of blood vessels, significantly lowers the risk of developing cardiovascular disease. Improves the function of the gastrointestinal tract, begins the restoration of the liver. Appetite and sleep also improve, which leads to the stabilization of the total body weight. Also all more likely to have dizziness, headaches. There is growing sentiment, however, the risk of failure and return to Smoking is maintained because of possible provoking situations. The lungs continue to recover and gradually fully attain their functions. The cough disappears, the teeth become white, and the cells of the liver continue to be updated. Halved the risk of heart attack and stroke. Reduced risk of cancerous tumors. The rate of full recovery can vary depending on the individual, but most patients significant changes occur during the year. The recovery process may take 5 years or more, if the length and intensity of Smoking will be quite high.